In helping drive OpenStack’s “what is core” dialog, I’ve had the privilege of listening to a lot of viewpoints about what we are and should be. Throughout the process, I’ve tried to put aside my positions and be an objective listener. In this post, I’m expressing where I think this effort will lead us. If OpenStack culture values implementation over API then our core definition should too. How do we make a core definition that values implementation over API? I think that our definition should also be based on what’s working in the field over qualitative definitional statements. The challenge in defining core is to find a way to reinforce this culture in a quantifiable way. The path forward lies in concrete decomposition (and not because you were talked to death on the sidewalk). Concrete decomposition means breaking Core into small units for discussion like “is provisioning a single server critical?” More importantly, we can use tests as the unit for decomposition. Tests are gold when it comes to defining expected OpenStack behaviors. In our tests, we have a description of which use-cases have been implemented. Discussing those use-cases is much more finite than arguing over stable versus innovative development methodologies. I believe that we are moving toward community tests playing an essential role in OpenStack. As a believer in the value of BDD and CI, I think that placing high value on tests improves the project in fundamental ways beyond defining Core. It creates a commercial motivation for contributors to add tests, inches us toward interoperability, and helps drive stability for users. In these ways, using tests to measure OpenStack drives the right behaviors for the project. Another consequence I anticipate is a new role for the User Committee (UC). With a growing body of tests, the OpenStack Foundation needs a way to figure out the subset of tests which are required. While the Technical Committee (TC) should demand a comprehensive suite of tests for all projects, they lack the perspective to figure out which use-cases are being implemented by our user base. Gathering that data is already the domain of the UC so asking them to match implemented use-cases to tests seems like a natural extension of their role. 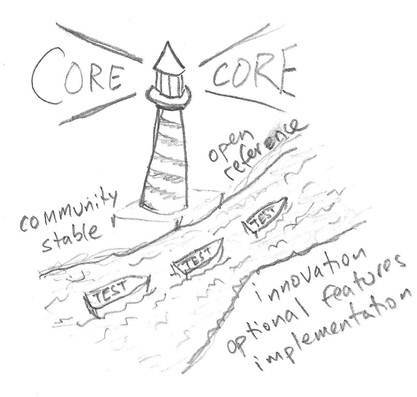 By having data supporting the elevation of tests to must-pass status, I envision a definition of Core that is based on how OpenStack is implemented. That, in turn, will help drive our broader interoperability objectives. This entry was posted in Continuous Integration, Open source, OpenStack, OpenStack Board, Quality and tagged BDD, Core, Decomposition, OpenStack, Testing by Rob H. Bookmark the permalink. Pingback: OpenStack社区周报(8.4 – 8.11) | UnitedStack Inc.